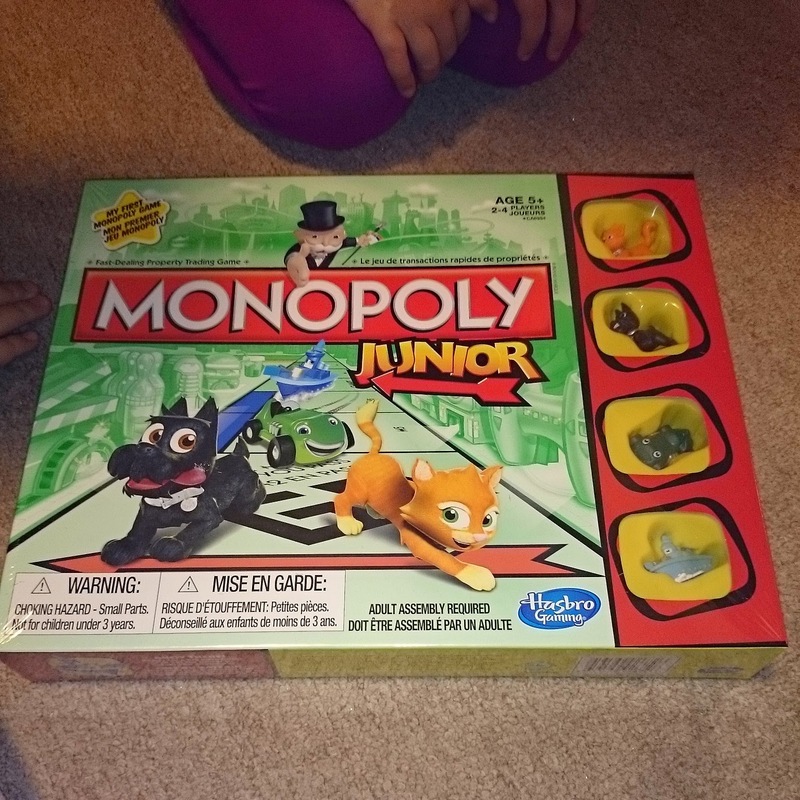 My family got chosen to be one of the families to get to a Hasbro Family Game Night Vox Box from Influenster Canada. The kids were so excited when I told them, hardly any of the stuff I get to try out is aimed at the kids. The odd book maybe but this was specifically for them and a fun thing too. Does this not look like the most fun game for a little kid? Cat was super excited that there was a cat piece to play. She has claimed it for every game we will play EVER. Ace has claimed the dog. I honestly hope any friends they have over that want to play are okay with that. A little background information for you: we are board game crazy in our house, we own six copies of Monopoly alone. (I know that's actually not all that many but my mom thinks it is) And I am the mom that gives board games for presents for birthday parties whenever possible. Family time is the best time and my kids love to compete with each other. As you can see we all have very different ways to set up to play, Cat goes about it in the most methodical manner. That only lasted until she started getting into the game, and she really did because the rules are simple and easy for her to follow which made it fun for everyone. The first night we opened the game there were four rounds played, I got kicked out after the first round because I won. The kids said it was because they didn't need me because it was so easy to play but I know it was really because I won. 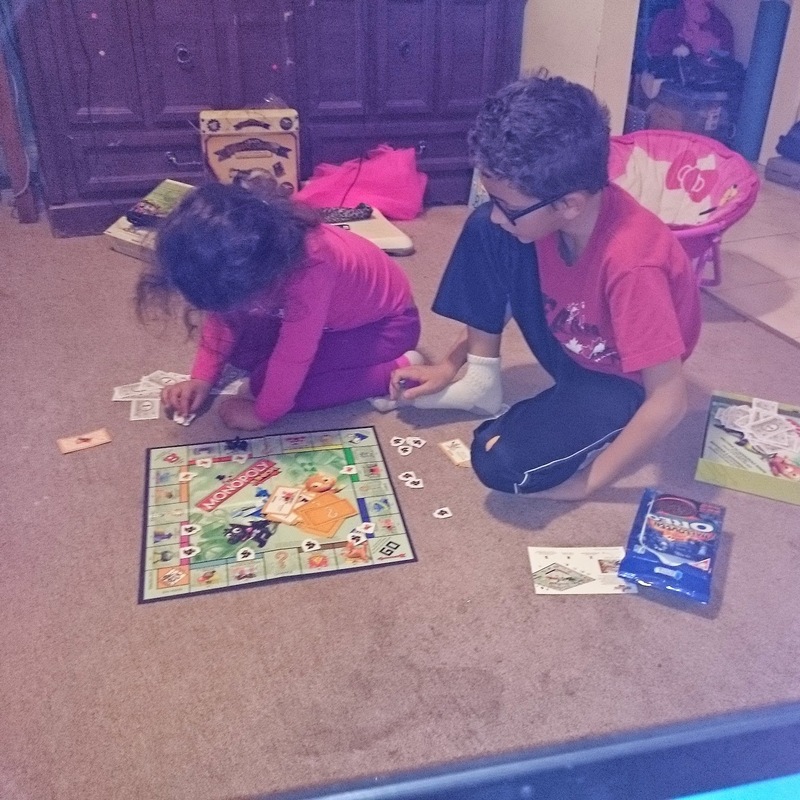 The picture above taken in the middle of playing highlights some of my favorite parts of Monopoly Junior. Instead of property cards, houses and hotels you get character tokens to mark the properties that you own. This is the most brilliant idea ever for small kids, Cat loved putting her cat tokens on properties and it was easy for her to keep track of who she had to pay. It's not very often I can snap a picture of them playing a board game together without someone sitting between them to prevent a fight breaking out because someone wants to invent her own rules. Needless to say this has quickly become their favorite board game. A big thumbs up from Cat, Ace and myself for Monopoly Junior. I did receive a copy of this game to facilitate this review, all opinions, however are my own. That looks like a great version of Monopoly for kids. I'm a big fan of Monopoly too, we've only got two versions in our house, both of them Lord of the Rings editions. That looks like so much fun! Monopoly is definitely a little too complicated for children, so I'm glad they made a kids' version.